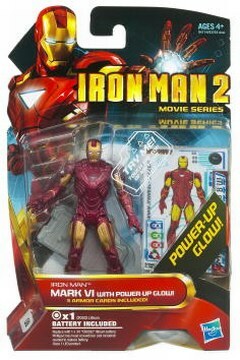 Impulse Creations has posted an image of the upcoming Mark VI Power Up Glow Armor from the 2nd movie wave of the Iron Man 2 toyline. This figure is scheduled to ship on March 1st(the official launch date of the toyline) but has been sighted at a few stores, such as Kmart. So what makes it different from the regular Mark VI armor? The torso on this version lights up once you press the head down, a trade off for the lack of abdominal articulation. Click on the thumbnail to the left to take a closer look, and happy hunting! ...there's actually more articulation lost. I just got mine today. The shoulders are on ball joints and can pop off(not loose though, fortunately). The range of motion for the shoulders is limited. Aside from them and the abs, everything else is the same as the other figures. 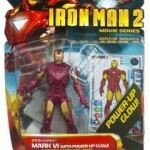 The figure on package is translucent but the actual figure just has a translucent red torso. Ill definitely have to see this one in person but if the whole torso is translucent and those shoulders do pop out too easily I think Ill just stick with the normal Mark VI...you lose the light but keep that great articulation and detail. The torso has some subtle red paint apps, so it doesn't look too obvious until you hold it up to the light. The shoulders don't pop out too easily...they will stay on unless you want them to come off. I just wish the shoulders had more range of motion, they can't swivel outwards to the sides much.